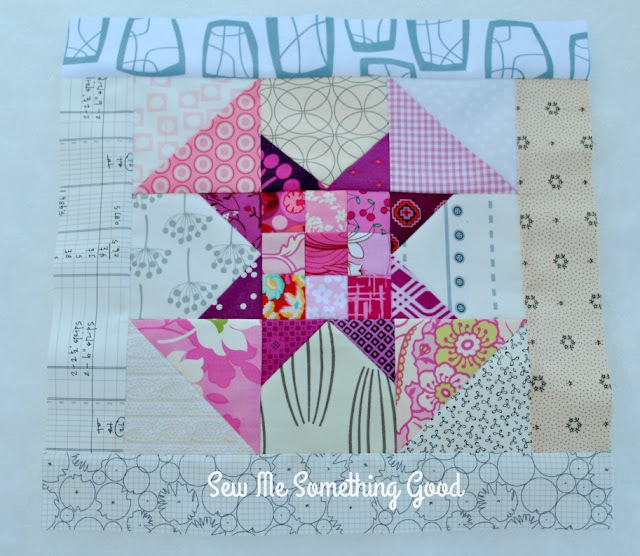 Today is week #4 in the Sewcial Bee Sampler sew along being hosted by Sharon Holland and Maureen Cracknell and this week's block is Crow's Nest. I am continuing to make my blocks colourful and scrappy as can be! My version allows me to incorporate as many fabrics as possible, which is one of my aims in this sew along. Clearing out my scrap bins and playing with some fabric treasures! Win, win. Maureen and Sharon are doing a wonderful job of inspiring and cheering us all on, plus giving lots of helpful tips. Instructions for each block are well written, so it's beginner friendly and for those of us with a bit of experience, we are free to play a bit with things (as I have been doing by making extra pieces in my scrappy versions ;o). Pretty bits of fabric and a pretty little vintage machine make for a very happy way to spend an afternoon. Love my vintage Singer 221K! This little beauty was a Mother's Day present from a few years back and each time I stitch with her, I marvel at the beauty of this machine as well as her perfect stitches! 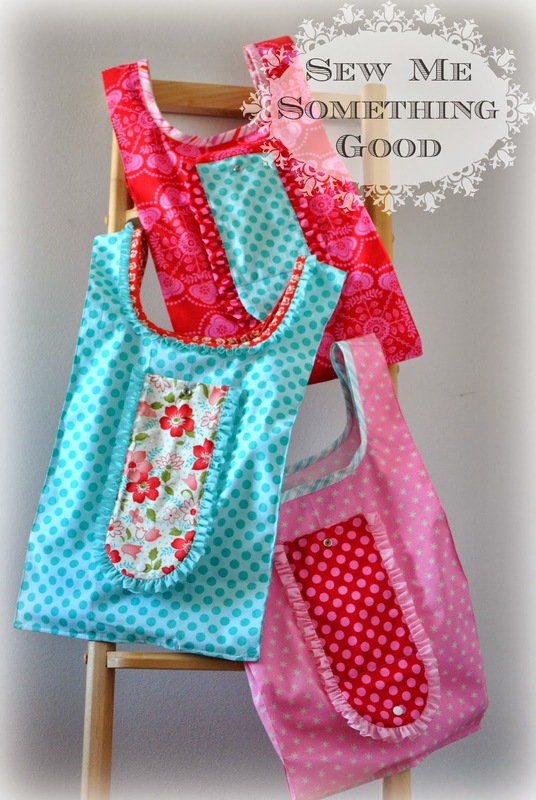 It is almost impossible for me to resist the temptation of sewing with scraps - especially bright and happy coloured ones. I don't even have a plan for these as of yet, I just wanted to sew them together and see where they lead me! 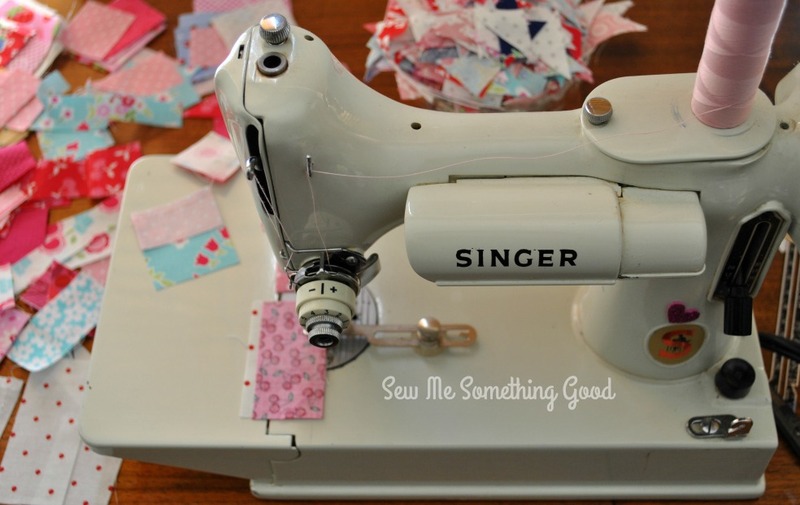 I love the possibilities they present and enjoy the process even more listening to the soft purr of my vintage treasure as we stitch some magic together. I am having a wonderful time rifling through my scrap bins and using up squares and strips from other projects to make my blocks! 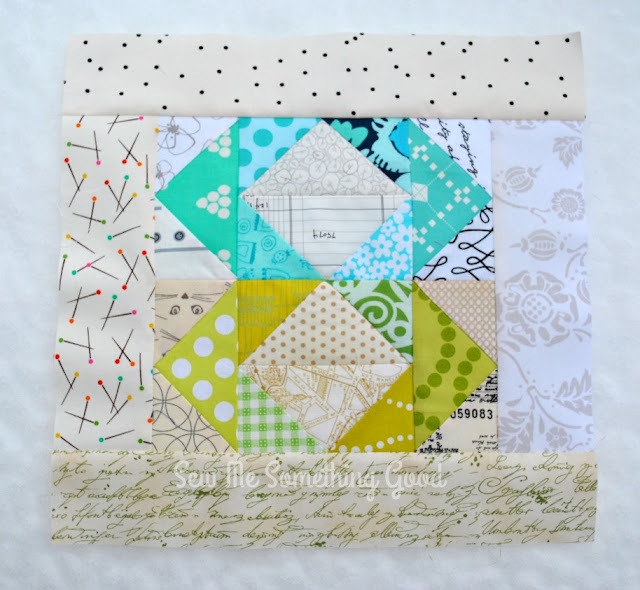 I am aiming for having a rainbow of blocks with a salad of low volume fabrics for the backgrounds, borders and likely for the sashing as well. Participants are sharing their blocks on Instagram (as #sewcialbeesampler) and while we wait for each new block design to be released, we are being inspired by all the beautiful versions being made. 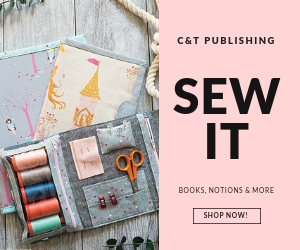 It's a friendly, supportive sew along that I can highly recommend, whether you're new to quilting or have experience. 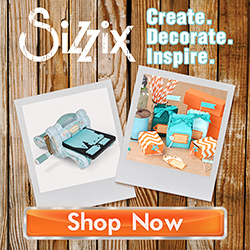 You can find all the information you need on either Sharon's or on Maureen's blog. 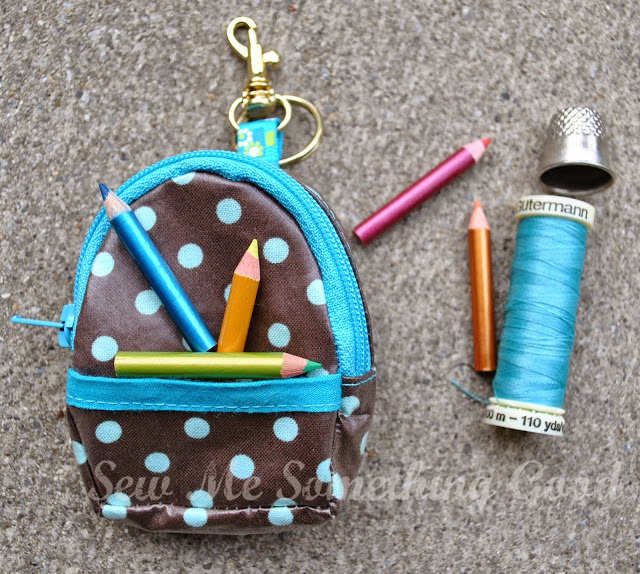 Today, I'm sharing glimpses at a couple of projects that I'm currently playing with. 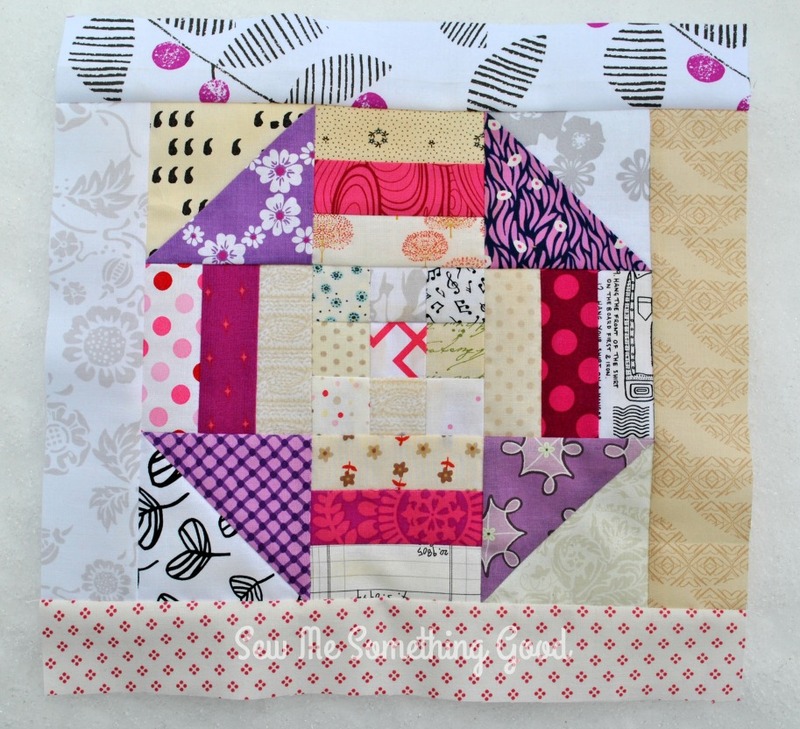 Scrappy patchwork is something that constantly calls to me and I find it so rewarding. My low volume fabric scraps were stacking up, so I decided they needed to be put to use! Sewing these tiny bits of fabric is something I find intriguing (you don't know exactly what the end will look like until you're done ;o) and very relaxing. 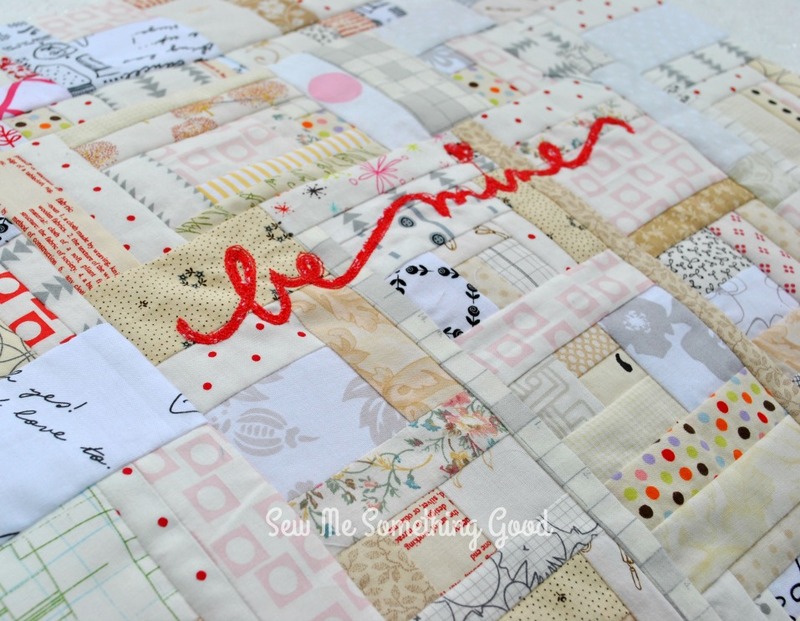 Smitten with scrappy patchwork - low volume fabrics make a great background for some machine applique! 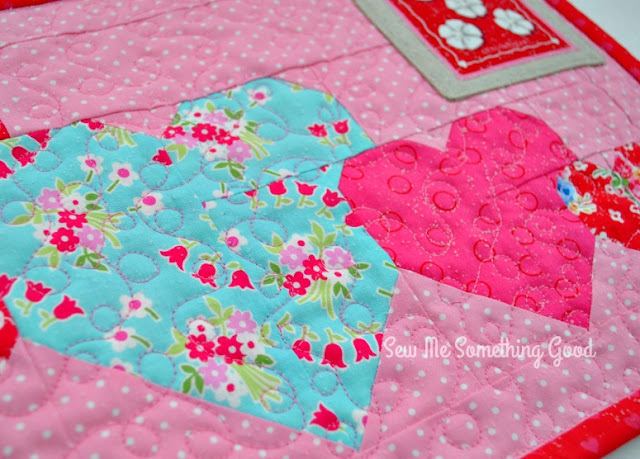 My desire to sew all things with hearts hasn't ended, as you can see from the new collection of hearts I have in progress (with more cut and waiting their turn at the sewing machine ;o). I obviously haven't managed to turn all my ideas into finishes in time for Valentines Day, but I don't mind. Ideas have been sparking, so I'm enjoying the process of dreaming and making, immensely. 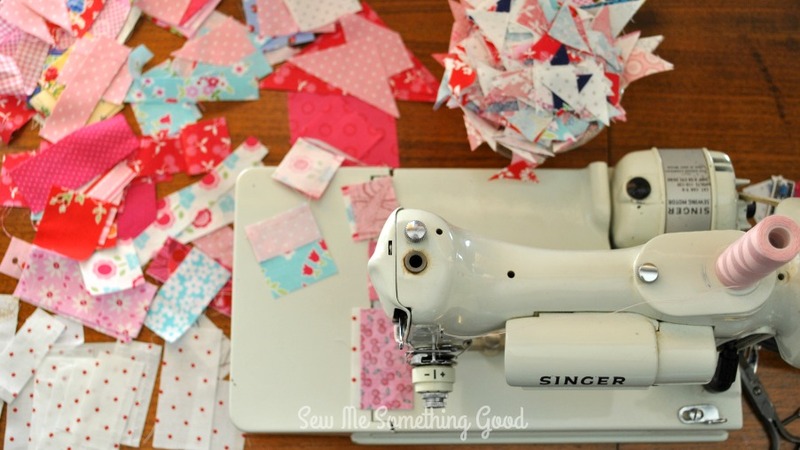 Do you know about the Sewcial Bee Sampler sew-along being hosted by Sharon Holland and Maureen Cracknell? 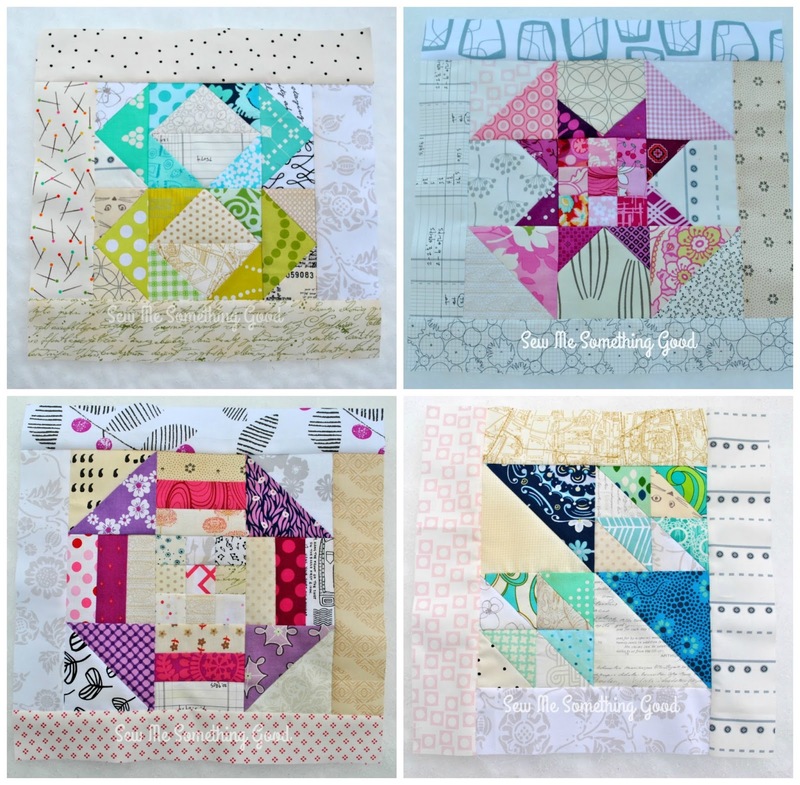 These talented ladies have designed a wonderful sampler block quilt and will be sharing the instructions for one block, each week for twenty-five weeks. 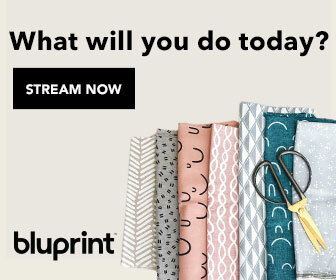 It's a no pressure, work at your own pace sew-along that I couldn't resist joining. 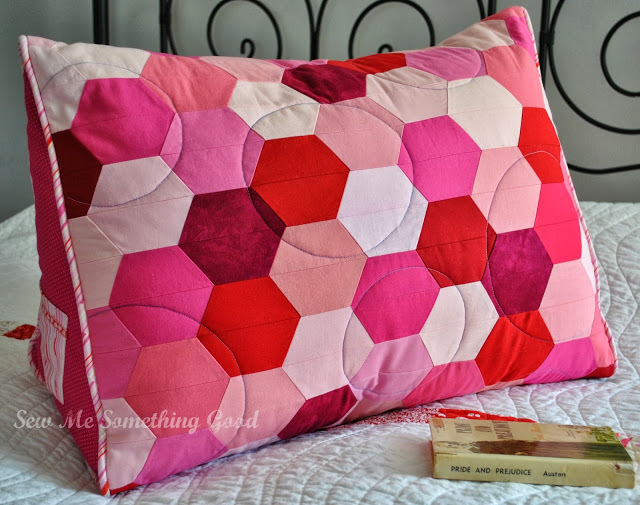 I knew right from the start, that I wanted to make my blocks scrappy, so that I could sew completely from my stash and as I've long admired the quilts that Stina makes using low-volume fabrics, I wanted to make this my opportunity to make something along that line. You can expect lots of scrappy colour and a myriad of low-volume fabrics to be making their appearance in my blocks! This is week two in the sew-along and it wasn't until last evening that I finally managed to decide how I would proceed. I've adapted both of the block designs so that I could use strips and squares from my scrap stash and as many fabrics as I wanted. 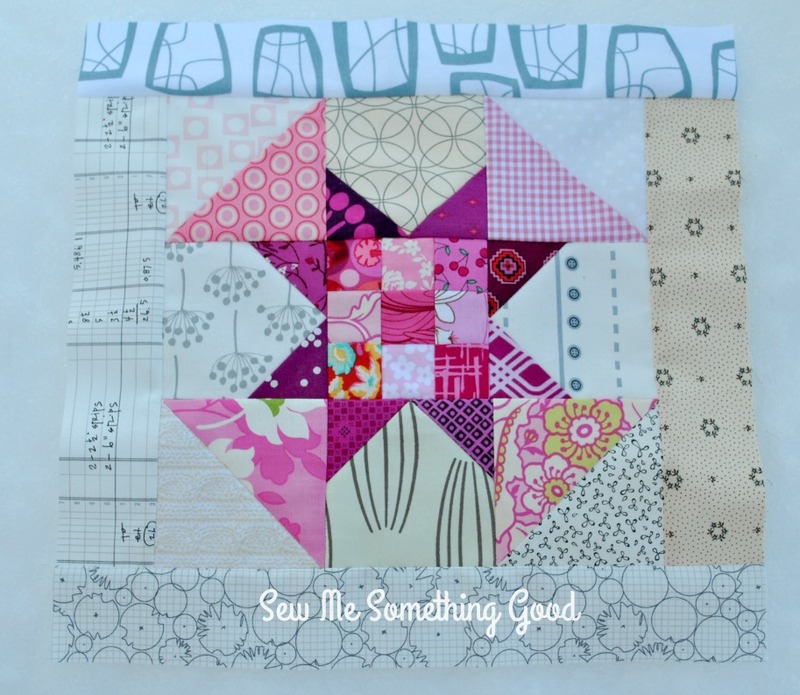 It does mean that piecing takes a little longer - for example the center square in the block shown below, is one fabric in the sew-along instructions and not a 9 patch block as I made. 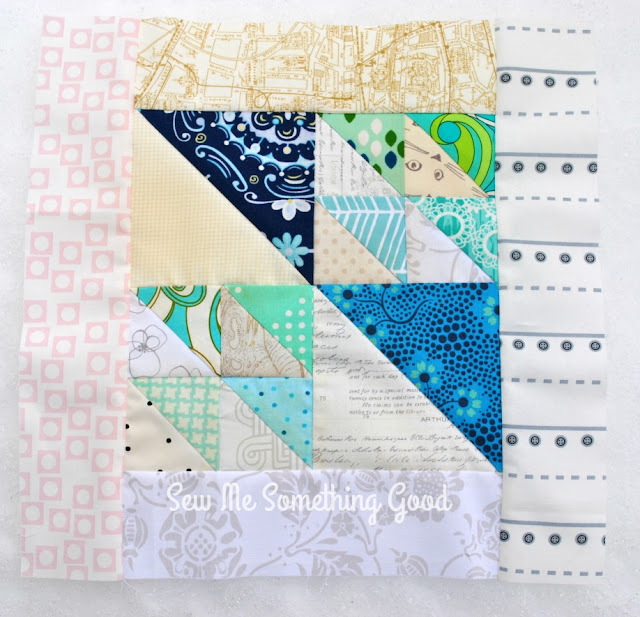 That's the beauty of a sew-along, you can make each block "yours" with your choices and seeing the versions being made by the other participants is very inspiring! 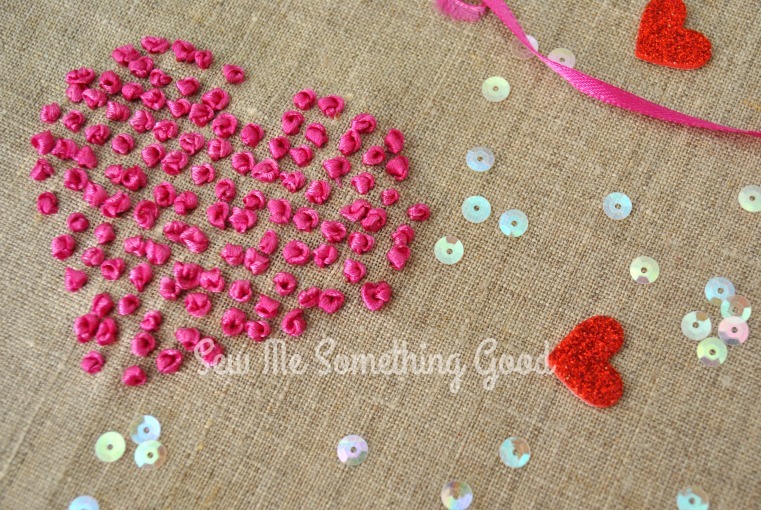 Stitching Hearts for the Kitchen! A year ago, I made a pair of linen tea towels embellished by some scrappy patchwork and they quickly became my favourites. They are pretty AND practical! 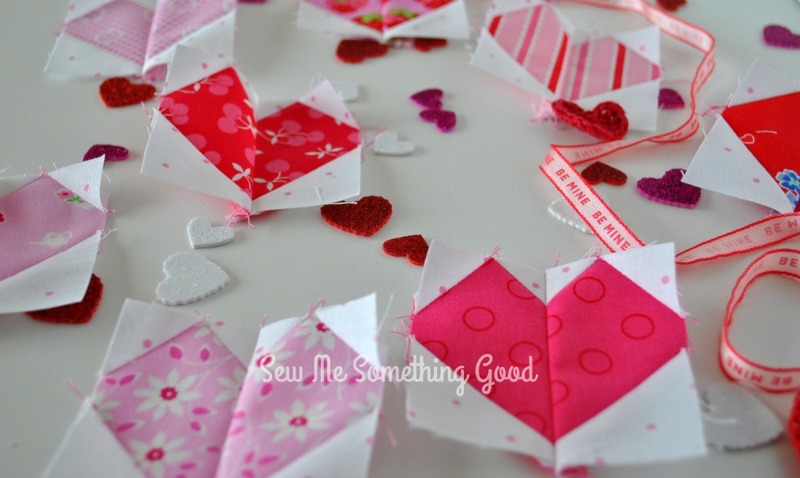 It's been in the back of my mind for awhile that I needed to sew another pair and when I found a series of tiny hearts sewn from strips tucked away in my WIP bin, I had an "a-ha!" moment. ;o) Sometimes the best ideas are right in front us! Linen works beautifully for tea towels - it is absorbent and it will soften over time. Call me crazy, but even with all the heart themed projects I shared in my last post, I can't resist making more. 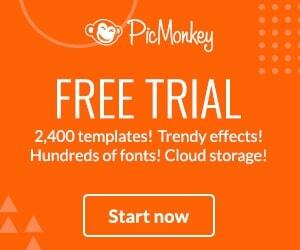 Especially ones that are quick and cute! I wrapped up my week with one such project. It's called the I Heart You Mini Quilt and it's a free pattern by Allison Harris over at CluckCluckSew. 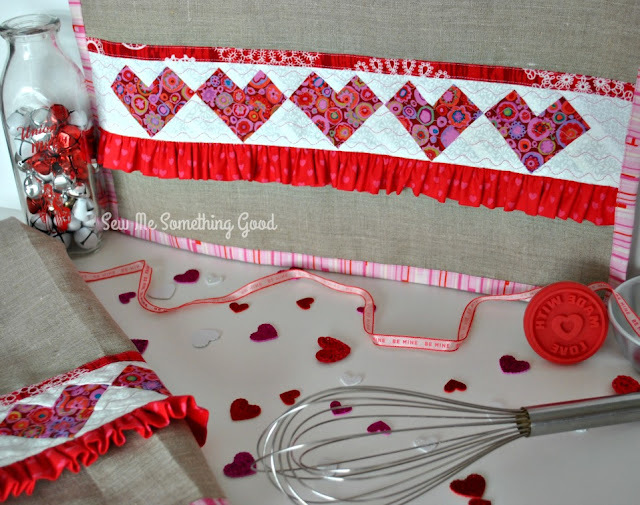 I love to welcome February by pulling out all my heart themed projects to decorate (and finish)!